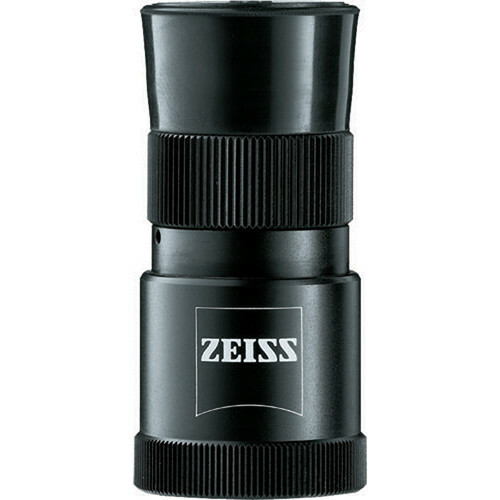 On its own, the ZEISS 3x12B Mono Tripler Monocular is a miniature telescope with moderate magnifying power, great glass, and an expansive field of view. It's even better as a magnifying glass, with an 8" close-focus distance. But if you pair it with one of the tubes on ZEISS Victory FL / RF series binoculars, it triples that tube's magnification, delivering the level of distant detail usually found in a spotting scope. And the Mono Tripler doesn't just produce raw magnifying power; because it has premium optical elements, including the famous ZEISS T* anti-reflective multi-coating and achromatic lens design, the monocular ushers the image to your eye with vivid clarity and color fidelity. The monocular comes with an adapter ring to facilitate its use with binoculars. Its aluminum housing is splash-proof, and its tiny size – under 2" long and weighing less than 2 ounces – makes it easy to have on hand at all times, so you're always ready to read the fine print, examine a bird or a painting, or turbocharge your ZEISS binoculars. Included with the monocular is a carrying strap and leather carrying case. Box Dimensions (LxWxH) 5.8 x 4.15 x 2.8"
3x12B Mono Tripler Monocular with Adapter (Victory FL / RF) is rated 5.0 out of 5 by 1. Rated 5 out of 5 by Anonymous from 3X 12B I own a pair of Swarovski EL 10x42 binoculars and I found out by chance that the Victory FL model of the Zeiss 3X 12B fits perfectly into the Swaro eyecups. It's a simple push in and use product vs. the swarovski 2x adapter that needs to be threaded on which costs time you may not have and possible damage to the threads of the eyecup socket.